Everyone loves a tasty, juicy burger, including you’re Labor Day guests. These recipes offer unique twists on the classic hamburger, incorporating ingredients like pimento cheese, sesame oil and serrano chilis. One way to make sure you’re treating a burger right is to top it with really great cheese. Here, the six best cheeses for burgers. As chefs Michael Chiarello and Sang Yoon discuss in their Chefs in Conversation video, there are a lot of ways to screw up a burger. One way to make sure you’re treating a burger right is to top it with really great cheese. Here, the six best cheeses for burgers. Perhaps the most popular option behind American cheese, salty cheddar holds up to strong flavors like the barbecue sauce on these incredible chicken burgers or the bacon and Russian dressing on these BLT burgers. Ultra-gooey, creamy Brie takes any burger to the next, luxe level. 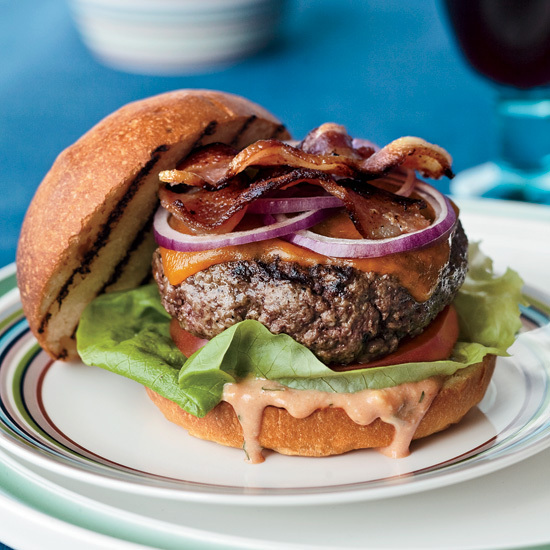 Try it melted on top of these bacon burgers or stuffed into these scallion-flecked burgers. Tangy goat cheese is a lighter choice for cheese. It’s great on these salty, sweet, piquant green-chile bacon burgers or these simple but super-filling double-decker burgers. Smoked Gouda and smoky barbecue sauce are a perfect match. Try the pairing on these messy burgers from Slows Bar-B-Q. It’s also a perfect complement to spicy horseradish on these flavorful turkey burgers. This is one of the best cheeses for melting, which makes it perfect for a super-gooey cheese sauce like the one on Bobby Flay’s nacho burgers. Thanks to its mild flavor, Monterey Jack can also handle bold Italian flavors like those in Michael Symon’s 50/50 burgers made with hot Italian sausage and ground chuck. Pungent, salty and stinky, Stilton is for real cheese lovers and big, bold burgers like these topped with an insanely good port reduction. Or try it in small doses, like on these mini cheeseburgers topped with onion jam.